Music has an amazing ability to touch people in so many different ways. It can make you sing, it can make you dance, it can make you happy or sad, and it can take you back in time to when you first heard a particular song or remind you of certain people in your life. It can also be the source of great inspiration and motivation. Music inspired John Shaw to not only battle back from a severe disability but also motivated him to share the joy of music with his local community. A self-confessed workaholic, John had grafted all his life, and had owned three garages and two hotels, when he was told that his spine had worn out and he wasn’t fit to work again. If that wasn’t bad enough, things took a turn for the worse in 2002 when he collapsed in pain whilst walking his dog in the park. He was rushed to hospital and was operated on to partly remove three and five discs from his severely damaged back. The doctors told him that he would never walk again and he spent the next eight months in a wheelchair. His world was shattered. Rather than sit about feeling depressed about his disability, John resolved to make positive use of his time and decided to learn to play a musical instrument. He enrolled at Blackpool College and began to learn how to play the keyboard. Sadly, the next year, the college decided that they weren’t going to continue with the music courses and John was left deflated again. John was determined to overcome this latest setback and by now the music bug had bitten him. Encouraged by the positive impact the course had had on his rehabilitation, John had his eureka moment. Why not start up a music school himself for disabled people and give them the opportunity to learn to play a musical Instrument at a minimal cost? Why not help bring some happiness to lives through music and help enhance their convalescence as well as their social life? He sought initial guidance from the CVS who advised him to form a committee and a constitution to enable him to apply for funding. With the help of a local bid writer, John secured grants from Blackpool Council and the National Lottery and his dream was starting to become a reality. In January 2006 Blackpool Music Academy first opened its doors at the Springfield Methodist Church on Bispham Road. Under the tutelage of retired college teacher, Jim Lomas, the academy soon grew from 22 students to 50 students in 6 months. Private tutor and music shop owner Steven Austin also a music examiner came on board to help as the demand increased. In 2007 the academy became a registered company Blackpool Music Academy Community Interest Company Ltd by Guarantee Within a year, John decided that he wanted to enrol younger students to gain the benefits of his group sessions. He recruited Tom Vernon as a specialist tutor for students aged 7-16 years of age and attracted over 80 youngsters for his affordable musical classes. By 2009, Phil Roberts had come on board and was putting the younger students through examinations to gain the Rock School qualification. A year later he was joined by Julie Jackson to look after the accounts and general administration. Tragedy struck in May 2011 when Phil died of leukaemia. Such was Phil’s dedication to the academy, he was still teaching his students two days up to his death. Always looking to improve and develop, John decided to relocate the BMACIC to its own premises and with the help of Roy White and the social enterprise loan fund, took possession of a former insurance brokers on Waterloo Road in South Shore. 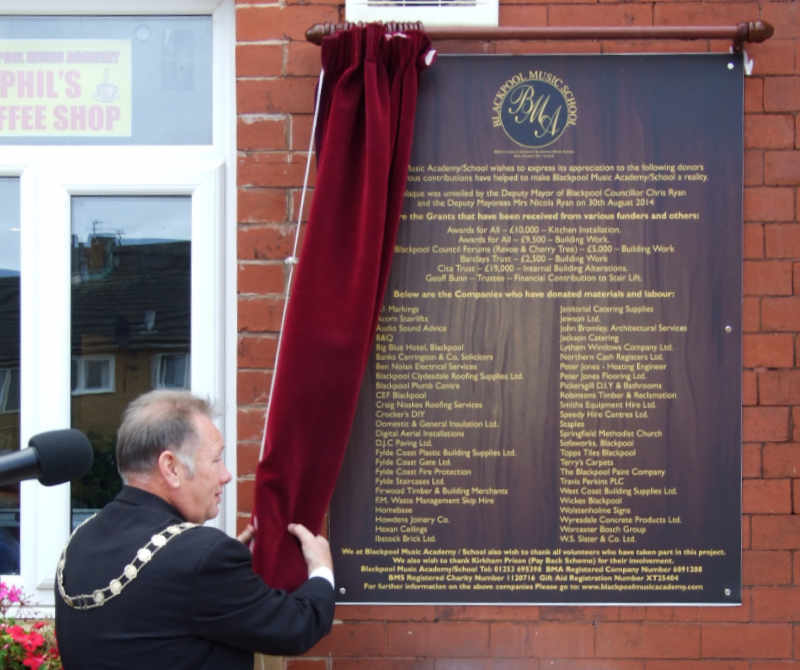 On the back of this overwhelming support from the local business community, the Blackpool Music Academy CIC opened its doors at the Waterloo Road site in June 2012. Included in the academy`s building is a conference room with projector, stair lift, disabled toilet and Phil’s Coffee Shop, dedicated to the BMS’s deceased former tutor who helped so much in making the school the success that it is today.